Although in recent years the Algonquin have resumed using the name “Anishinabe” which they have called themselves since time immemorial, the term Algonquin was imposed on them for more than 400 years by Euro Canadians. We know that the Anishinabe is the name that people used when referring to themselves and that it meant "real men (or humans)," but there are still questions about the origin of the name “Algonquin”. What we do know is that it was Samuel de Champlain who first identified the Anishinabe nation by that name when he arrived at Tadoussac in 1603. Champlain arrived and was greeted by the Innu leader, (who the French people then designated as the Montagnais) Anadabijou, when they celebrated a great victory over an enemy group of Iroquois. In addition to the Innu, the celebration also included the Maliseet and another group that Champlain did not know but he designated under the name of "Algoumequins". Historians disagree on the origin of the name. The most commonly accepted explanation, supported by G. Day (1972), is that during this meeting, Champlain asked about the unknown group to the Maliseet Chief and he told him "el legom kwin", meaning "they are our friends, our allies." However, this explanation is challenged by others researchers because of differences in pronunciation between this word and «Algoumequin» which Champlain used thereafter. JNB Hewitt, a specialist in Iroquoian languages, ​​argued that the name comes from the Mi'kmaq term "Alkoome" which means "they stand on the gunwale of the canoe to see the fish in the water that they catch with a spear." However, this explanation is doubtful. Since the Mi'kmaq were not present during the meeting with Champlain at Tadoussac, it would therefore be surprising that the Mi'kmaq language had been used in trading with Champlain. Moreover, nothing indicates that the Anishinabe used this method of fishing, at least not more than any other group and certainly not to the extent that this feature distinguished them from other peoples. 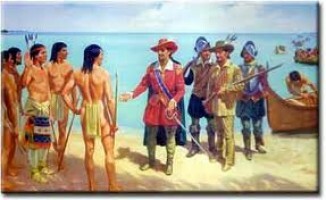 It is more likely that Champlain heard the name from the Maliseet who were present on this occasion. 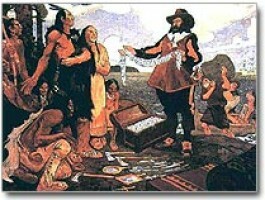 We must remember that the explorer met the Anishinabe while they celebrated their victory. He also took the time to describe in great detail the dance that the men and women were performing in front of him. It would therefore be logical that the term used by the Maliseet host was "a'llegon kin" which means "They are those who do the dance." No one in the Anishinabeg communities would be insulted to be referred to as Algonquin, but we would appreciate that you use the appropriate term, Anishinabe.